The men in my family love doughnuts, so I have been searching for a good recipe for quite a long time and finally got one from bakingabout.com. 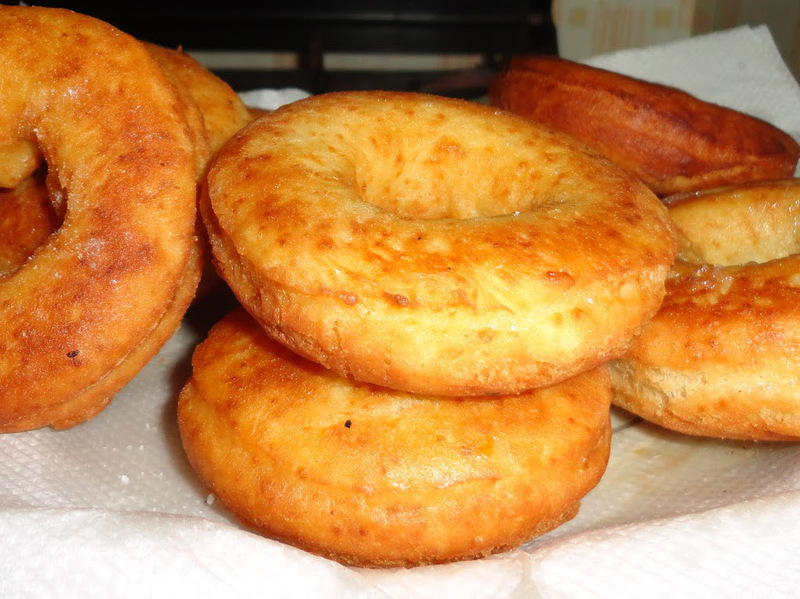 There are generally two types of doughnuts, cake doughnuts and raised doughnuts that are made from yeast. The recipe Iam sharing today is a cake doughnut. It is extremely easy to make. 1. Mix together flour, baking pdr, sugar, cinnamon pdr in a mixing bowl. Take butter and mix it in this flour mixture until its comes to sand like grainy consistency. 2. Now warm the milk. 3. Make a well in the middle of the flour mixture and add the milk and the beaten egg. Mix well. 4. At this time the dough will be quite sticky. Place the dough on your clean kitchen top and keep on adding little flour and mixing till the dough no longer sticks to your hands and you can shape it into a soft ball. 5. Though the original recipe doesnot say this but I rested the dough for about 20 mins. 6. Dust your kitchen top with flour and roll the dough into 1 inch thickness. If you have a doughnut cutter you can use it to cut the doughnut dough. I used one small bowl and a small bottle cap to cut into doughnut shapes. Do remember to dust the cutters with flour before cutting. 7. Heat oil in pan for deep frying. Fry them till they are golden brown on both sides. Drain them on a paper towel and cool them to room temperature before dipping them in the chocolate sauce. 8. For the sauce grate chocolate and put it in a microwave safe bowl for 10- 15 seconds on high power or till the chocolate melts.Add cream to the melted chocolate and microwave for 5 secs and the sauce is ready. 9. Dip the doughnuts in the chocolate sauce on one side and let it rest on wire rack for the excess chocolate to drain. 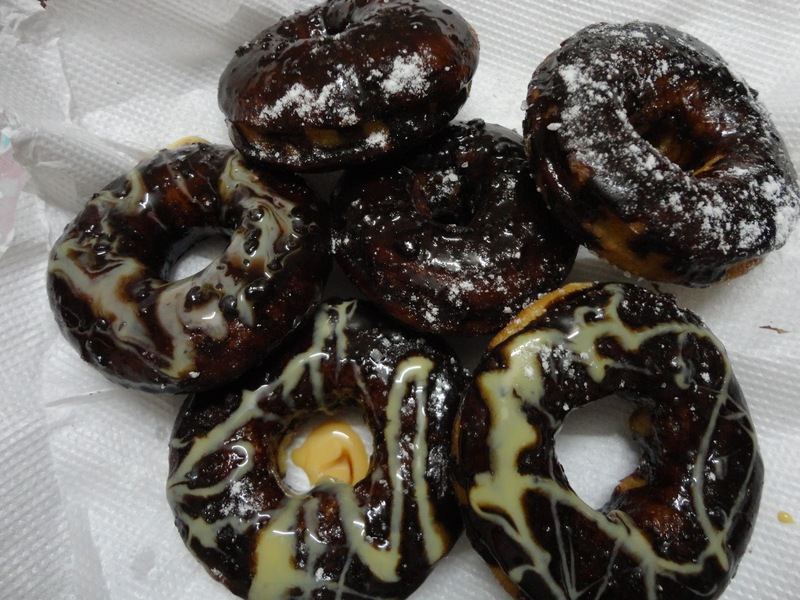 If you are not a chocolate fan just sprinkle some icing sugar on the doughnut and its ready to be eaten!